New project featuring 67 three-story, row-style townhomes in a gated, downtown Tempe location! 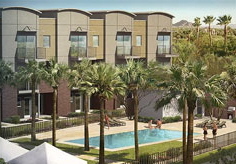 2 bedroom, 2.5 bath homes, and some with dens/lofts/office space, from 1265-1737 sq ft approx. There will be a 'live/work' area with loft-style homes, and all units have attached garages. Features include maple cabinets, granite countertops, and pre-wiring for security and surround sound systems. The community boasts a pool and spa, poolside cabanas, BBQ area, and a dog park! Walk to the future light rail! Across the street from the new Tempe Center for the Arts. Contact us NOW at 525@weareazrealestate.com to get in on this fabulous location, or for more details!